When we first moved into our home in 2001, we weren’t lacking for storage space (yet)…but we wondered if there was usable space under the stairs. 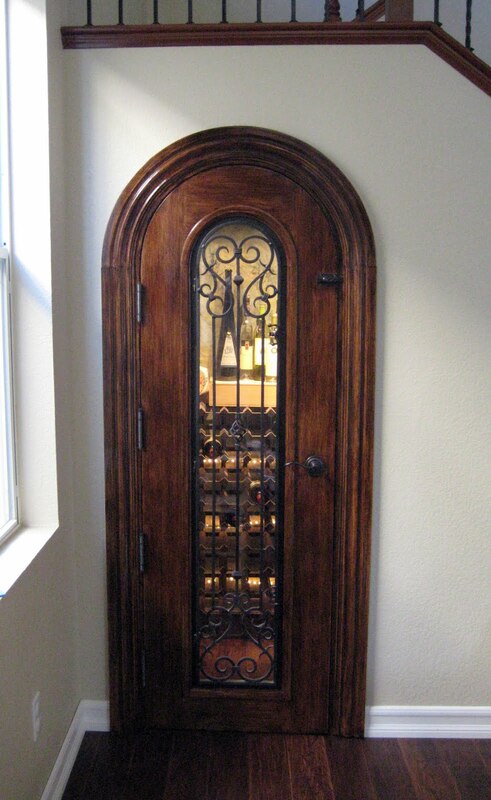 I noticed the trend in a lot of my clients’ homes to convert small closets into wine rooms, so we thought that the area under the stairs might work as an extra closet and wine room (not that we drink a lot of wine or have a huge collection of premium vintage, but it would be nice to have a pretty place to display the bottles we had rather than store them in the kitchen pantry). Then, when a few of our neighbors (who have the same model/floor plan), remodeled their homes and put in that extra closet under the stairs, not only did we know it was doable, but now we had a referral to a contractor (Jim Sellars) who had done a great job for our neighbors, and was very reasonable. I figured I could just re-stain or glaze the door to match our hardwood floors. After Jim built the wine room and installed the door (he actually had to cut the bottom a little shorter to make it fit), we had hard wood floors installed with some of the leftover wood from the living room, and I somehow found a couple of weekends to do a Venetian plaster finish, throw in a bunch of boxes of games and toys and paperwork that I wanted to hide away, and my husband hung up a curtain rod for a drapery panel I had found at Marshall’s (to cover the storage area). This was over a year ago. I just didn’t get around to painting the door for quite some time after that. The wine room door was one of the first weekend projects I completed in the beginning of this year. It took a few hours over two days, to allow for drying time. 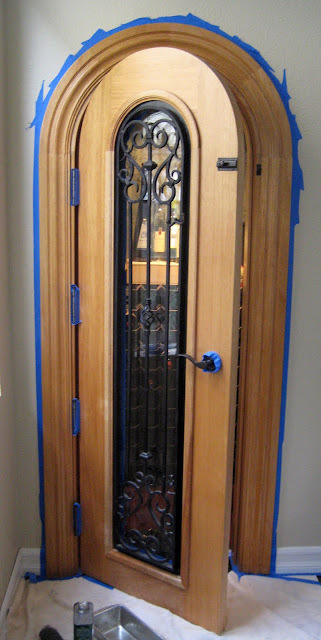 Day one was taping/prep, de-glossing the existing finish/varnish, and then applying the oil-based glaze to both sides of the door and the jamb. The second day I added another light glaze coat in a slightly different color to soften some of the brush strokes and add richness to the reddish brown tones. I was pleased with how it turned out and it matches our hardwood floors while still tying in the reddish-brown handrails on the stair case. So I guess I can check this one off my “To-Do” list. Yay!!! Now I just need to make a trip to Trader Joe’s to stock up on “two buck Chuck” to fill the wine racks! Thanks for the tips, Katie!! I'll contact you if I have any other questions! Jim sounds awesome! We had a great contractor, too – in 2008 he and his crew remodeled our kitchen, laundry room and downstairs bathroom in 2 weeks (even fitting in the granite installation). We're not looking into completely re-doing our master bath just yet. I just want a color update for now – it's been about 8 years since we last changed it (gasp!). So you and I are in the same boat with the home projects (except you make much better design choices than I do!). Let me know if you need Jim's contact info. He's the one who did my neighbors Elissa, Kristin and Ron's great room remodels. He did the wine room in a day, including drywall, electrical and installing the door! Irene: Thanks for reading! I'm hoping to stock the racks up nicely so you can come over and help me enjoy the wine! Melissa: "to strip or not to strip," that is the question! It depends on the condition of the cabinets and what look you're trying to achieve. If you just want to go with a darker stain and still see the natural woodgrain coming through, then I would suggest removing the varnish and lightly sanding. In the case of this door (since it's indoors and in a relatively low-traffic area), I just used a chemical varnish remover that does not require sanding. It's basically a de-glosser that allows the subsequent layers of stain/glaze to adhere. I'll get the name of it for you (I get it at Lowe's). It's pretty heavy duty stuff…so gloves, mask, and steel wool are recommended. Using an oil based stain or glaze also provides more durability (although it takes a little longer to cure). If you don't care about the existing finish appearance of woodgrain) and just want to change the look/color and paint over it…then you don't have to remove the varnish. Just use a really good primer/basecoat and then paint or glaze over it! There are primers out that that stick to anything: metal, ceramic tile, you name it! You can also spray or brush on a polyurethane clear coat afterwards for further protection since it's in a bathroom. If the condition of the cabinets is rough (cracked/peeling paint), then you'll need to sand it to achieve a smooth surface for the paint. Let me know if you have any other questions…I'm happy to offer tips! Great job!! Did you have to remove any existing varnish? I want to stain our master bath cabinetry instead of replacing them but removing the varnish scares me (read: too much work). Any tips? you had me at wine…beautiful!